Christmas Chocolate Baubles in red, green and gold foil are solid balls of milk chocolate. 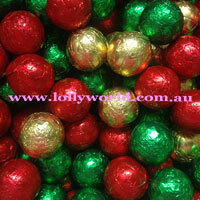 Made by Pink Lady in Australia, these festive little chocolates look to good to eat. Decorate the Christmas table or fill little jars, these chocolate will be an elegant addition to your special Christmas lunch or dinner. Perfect to include in a Secret Santa gift, a sweet little jar with a festive ribbon. They are roughly 2cm in diameter. Christmas Chocolate Baubles in red, green and gold foil are solid balls of milk chocolate. Made by Pink Lady in Australia, these festive little chocolates look too good to eat. Decorate the Christmas table or fill little jars, these chocolate will be an elegant addition to your special Christmas lunch or dinner. Perfect to include in a Secret Santa gift, a sweet little jar with a festive ribbon. They are roughly 2cm in diameter.